Before cell phones became as popular as they are today, people had to have faith in their preexisting plans. If you set a date for 7o’clock, you could not text the person to say you were running late. If you went to pick someone up, you couldn’t call them to say you were outside; you had to get up and go knock on the door. Cell phones have forever changed the way we communicate and operate in our daily lives. Statistics state that around 90% of American adults own a cell phone while 29% say that it is something they cannot live without. In addition, 67% of these cell phone owners state that they often check their phone for messages or missed calls, even when they haven’t heard their phone ring. With our lives so heavily reliant on cell phones, it’s no wonder why the government has cracked down so hard on cell phone use while driving. Although the amount of cell phone tickets issued dropped drastically in 2014, the steep penalties seem to get harsher by the month. Outside of the large fine you receive, some areas even issue up to 5 points on your record. With penalties and fines such as these, it is essential to invest in a device to make driving easier. That’s where we come in. 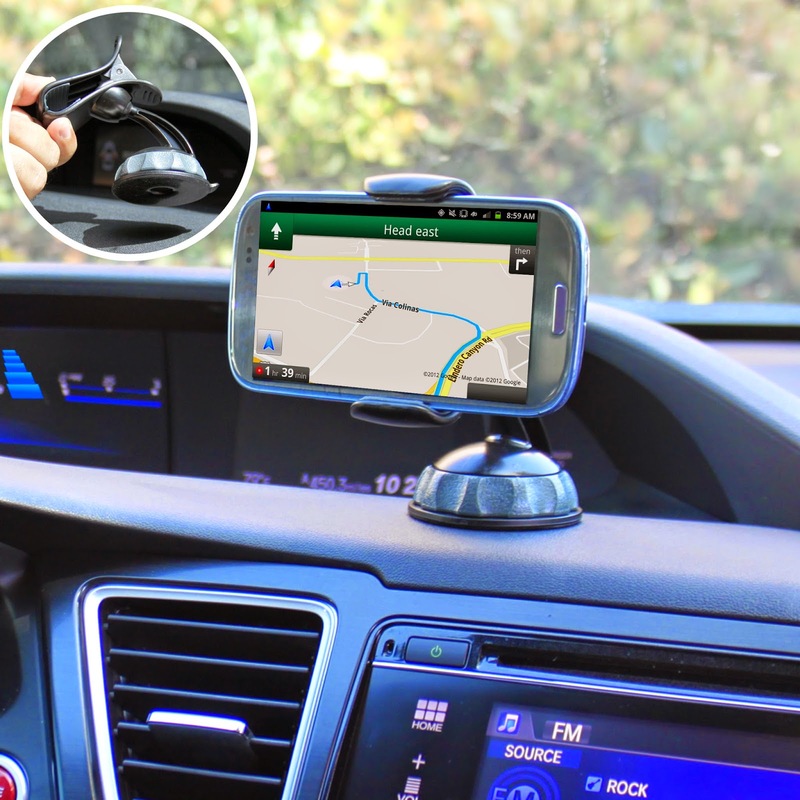 The USA Gear Universal Windshield Dashboard Car Clip Mount Holder allows you to enjoy your cell phone’s music or GPS without breaking the law. Not only does it keep a little change in your pocket, it also keeps those valuable points off of your driving record. The USA Gear Clip Mount will mount most Smartphones, GPS units, MP3 Players, Cameras and more to your dashboard, windshield or even your desk. The spring loaded clip and rubberized grip holds devices up to 3.5 inches in width, and features a 360 degree rotating ball head for portrait or landscape positioning. With place and twist installation, the clip mount couldn’t be easier to use. The advanced sticky pad suction cup securely adheres to most textured surfaces and is easily reusable. Go to www.accessorygenie.com to secure your mount today!